Friends were coming over to dinner and my husband decided to gift them these cute pumpkins he found at Sur La Table. They were on sale! We filled them with Hershey's Kisses and then I went into my studio to doll them up. I used some leftover Very Vanilla Stitched Shapes and added some leftover Copper Foil pumpkins from Patterned Pumpkin Thinlits and a tiny piece of Black Mini Sequin Trim. My sentiment is from "Something Good to Eat" (September 2016 Paper Pumpkin) and is stamped in Early Espresso onto Crumb Cake card stock and cut with a 1" Circle Punch. The Black Chevron Ribbon is retired, as is the Gold Cording I used to tie my tag onto the ceramic pumpkin dish. I'm so glad you stopped by today! Please leave me a comment so I know you were here! 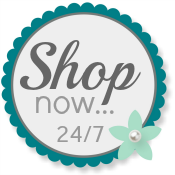 Use my Online Store any time you need some Stampin' Up! products to finish your projects! Please check out my friends in the November Pals Blog Hop! You can start here.